What is a yacht project manager and why do I need one? Any project needs to have proper planning, control and a responsible overview regardless size, location or type. Whether a project manager is required largley depends on the owner, their experience and expectations for quality. 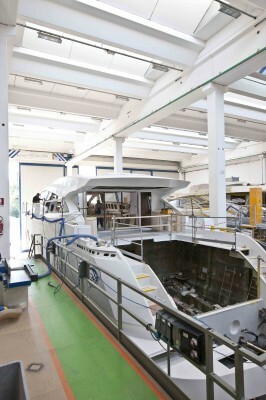 Some shipyards building smaller vessels may not have a requirement for any input or supervision due to the production line style of construction. For any project where there is a deviation from the standard then a representation on behalf of the client is recommended to ensure the desired change is delivered and to the anticipated quality. The earlier this representation is included the better as it shall benefit the Owner and also ensure the project manager has an overall perspective of the entire project. Even as early as the design stage, it can be an advantageous to draw upon the knowledge and experience of a professional project manager to ensure efficiency, save money and avoid potential issues thanks to early planning. The manager should be on hand full time to pull together all the strands of the project to form a tight cohesive team, to plan, coordinate, monitor and above all control; in short to ensure that the project is brought to a satisfactory conclusion, on time, in budget and to the quality specified. What can a Yacht Project Manager do for me? Authorize and / or disperse payments as needed. Represent the owner of the yacht and his best interests on site. What about the Production manager at the Shipyard ? Build and Production managers supplied by the shipyard are often not project managers in the purest sense. They monitor work schedules and ensure materials and labour flow but their primary role is to represent the shipyard and see the shipyard makes, or does not loose, money. They do not necessarily have the owner’s interests at heart. By contrast, the yacht build project manager needs to be more like a Master Shipwright or Master Builder who traditionally had full control and overall responsibility for the build and launch of the vessel directly for the vessels owners. Where do I find a quality Project Manager ? A Project Manager could be anybody that you deem has the experience and necessary skills to manage the project but more importantly the owners best interests from start to finish. Many yacht captains, engineers and ex-crew reach a stage in their career where they seek a lifestyle ashore and the collective knowledge of years at sea can form a great foundation for overseeing shipyard projects. Specialist skills can also be attained to further support the credibility of a project manager such a surveyor qualification, fundamental ship building knowledge and also management skills. Some companies, such as Acronautic specialize in providing project management for projects up to 200 tonne whilst others such as Hill Robinson can draw upon a large team of industry specialists for larger projects. Superyacht Tenders & Toys is another company that specializes in customizing Jet Ski’s, small superyacht tenders and nautical toys proving that project management has no limit, large or small. Sourcing a Project Manager can be achieved through advertising in nautical classifieds, recruiting through yacht crew agencies or even through local newspapers.